Thank heavens for PCOA! Each organization and service within its walls provides support on a daily basis to our lives (especially monthly dances). My lifelines are the professional social workers, (love them) who guide me through the reams of paperwork for all agencies, the Low Vision Group that supports & encourages me to be able to function in the sighted world, and Transportation. However, my favorite place to visit is the cafe and shop. 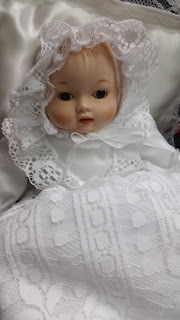 While browsing in this treasure trove I found a little doll with material and pattern for a lovely christening outfit with pillow. 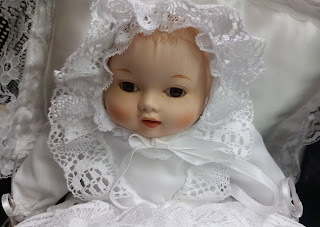 So off I went to the head of the sewing group, Laura White, who got her daughter Laura Jean to tackle the job. 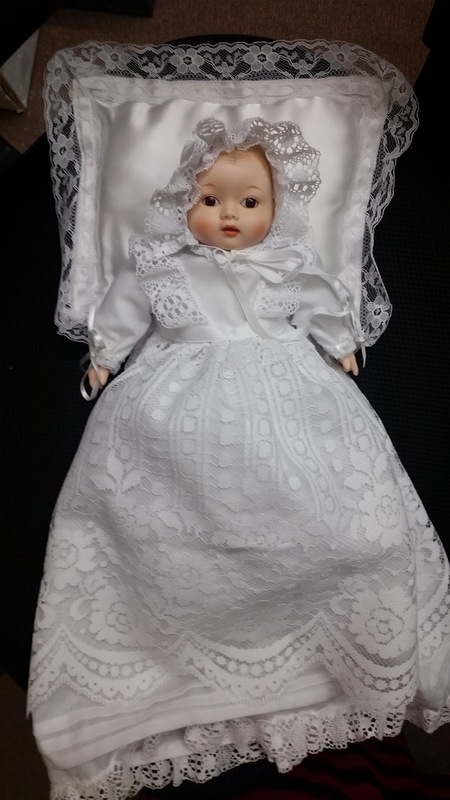 Enclosed is a picture of the excellent workmanship she provided in adorning my doll in this exquisite bonnet & gown. Thank you to the donor, Laura and Laura Jean, and and all the volunteer seamstresses who help me with alterations. Also kudos to the woodworkers who repair and restore my furniture. How blessed we are to have cheerful staff and volunteers, of which I am one, to make our golden years easier and a whole lot of fun. God bless you all!